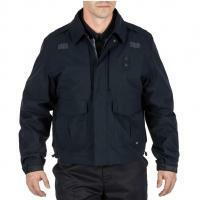 511 Tactical 4-in-1 Patrol Jacket (48027) FREE SHIPPING! The 4-in-1 Patrol Jacket features high-quality Dupont® Active Layer waterproof/breathable material in the shell that creates a superb performance-oriented jacket. Double storm flaps in the front further work to keep the elements out. A detachable rain hood makes this jacket outstanding for very wet weather. The 4-in-1 also features front chest pockets compatible with our Backup Belt System® system. For adjustable warmth, a stand-alone inner fleece jacket is included and can be worn by itself. The fleece is windproof and conservatively styled. Of course, the 4-in-1 includes our ANSI II traffic vest. ©2002-2019 CopsPlus.com: 511 Tactical 4-in-1 Patrol Jacket (48027) FREE SHIPPING!